Among the statesmen and presidents at the National Portrait Gallery in Washington, D.C., there's now a sandwich maker, a seamstress, and a grape picker. 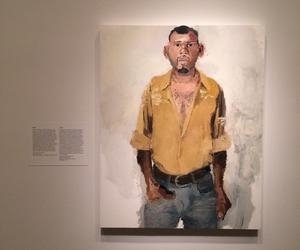 "American portraiture has been about the elite, where the wealthy subject was able to hire an artist," said Dorothy Moss, co-curator of the exhibition "The Sweat of Their Face: Portraying American Workers." "So you wanted to open it up?" asked Miller. "Oh, definitely, yes. It's very important to make sure that we are representing multiple perspectives, that we are representing everyone who walks through our doors." There are 80 works of art in this exhibition, in all media, but it is not meant to be a historical representation of the American labor movement. "This is portrayals of everyday workers," said Moss. "The real people." Real people like the "Migrant Mother" in Dorothea Lange's familiar photograph, and "Willie Gee" in the painting by Robert Henri. Gee was the son of freed slaves who was a paperboy in New York City, delivering papers to Henri's studio. "I love this portrait because I think it exemplifies such empathy, it's such a tender portrayal," Moss said. Tender portrayals, of difficult lives. "These are the people who are out working constantly, working in difficult circumstances," Moss said. "Immigrant labor, child laborers, custodians, people who tend to gardens, people who are part of our lives, our families. This is who we are as a country."